Greetings on these final days before Winter Solstice — the shortest day of the year — and as we all roll into a collective 2012 moment many have long been awaiting with some level of anticipation. I can personally feel the excitement building, though I’m also feeling the intense emotions stirred by the recent senseless tragedy in Newtown, CT and the promises for humanity’s future the world’s children all hold for us. Tragedy connects hearts in massive waves, which are all part of the time-encoded unfolding that the Universe is weaving together for us now. When something this large — and political — happens, in astrology we turn to the wise planet Jupiter — which could be a mini solar system all on its own. Jupiter is massive and the largest and most powerful planet in the heavens, representing two and a half times the mass of all the other planets in the Solar System combined. It also rules the 3 p’s of power: politics, public policies and parties. When you examine the glyph for Jupiter, it is constructed from a half moon balancing on the edge of one arm of a cross. If you look at it, it’s the half of the Moon (emotions) that links our hearts in the emotional realm and is a place where we balance our grief with power and wisdom. It’s often felt as the dark side of the moon. When we are there, we are asking ourselves deep questions and seeking a positive “way out” (Jupiter’s realm) of our collective pain. 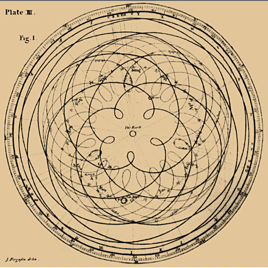 The symbol for Jupiter contains the emotional intersection of our hearts with the vertical World Tree axis, forming a cross where truth meets the flow of emotional reality across time. 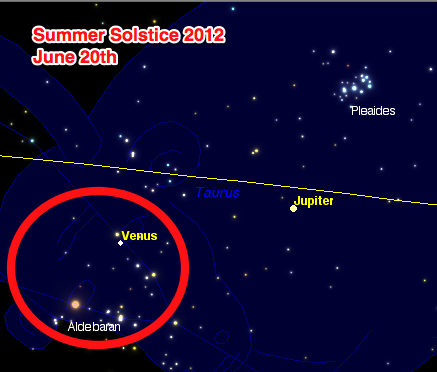 At the time of Winter Solstice 2012, Jupiter is retrograde and is forming a close alignment with the giant red star, Aldebaran — the “eye of the bull” — in the constellation Taurus, the star that appears to focus rage. Orion, the constellation below the ecliptic, is standing there, with his shield deflecting that rage to move it through the Pleiades, beyond our galaxy and away from its focus on the galactic center — which is at the opposite side of the horizon pointing inward to the center of the Milky Way, and where Winter Solstice occurs. 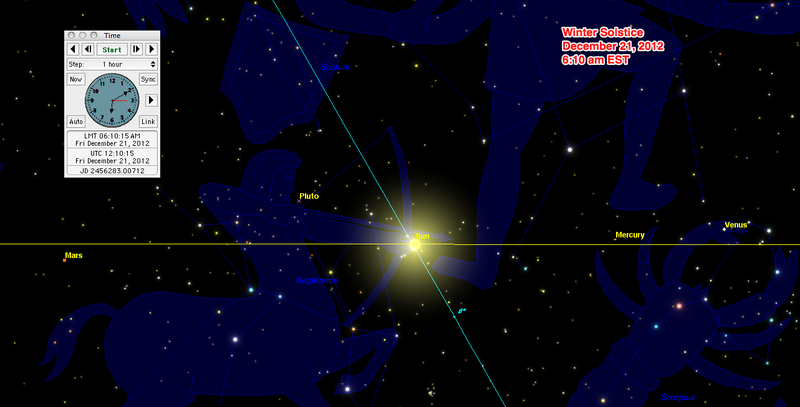 The position of Jupiter at Winter Solstice is very close to where Venus was aligned with the “other eye” of the bull, the star Ain, on Summer Solstice June 20, 2012 (when our group last held the Lady of Cholula posture). It’s as if Venus left a secret “twinkling” message with Ain for Jupiter to receive at this time, using the right br-Ain (which ritual postures help us access) of the bull to retrieve it. Orion holds the gateway to the rest of the Universe — to galaxy upon galaxy beyond the Milky Way. This time was always seen as a moment where we make this connection as cosmic citizens — who desire living in a peaceful world and how our wills can make it so. What’s even more amazing is the position of Venus — the goddess of love and peace (and war) and ruler of Taurus — at Winter Solstice. 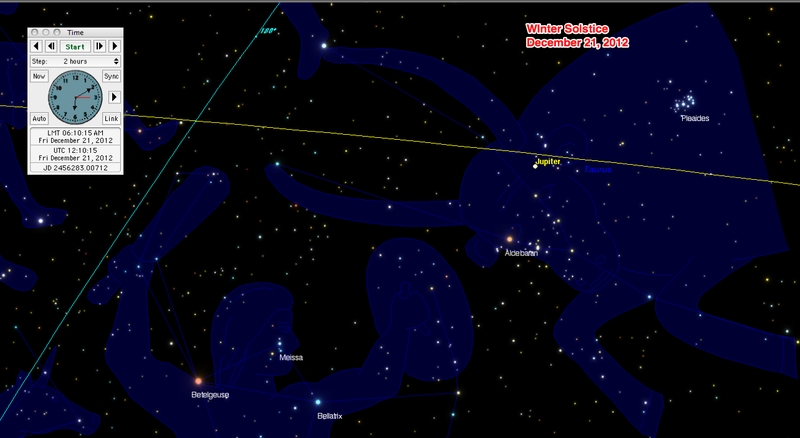 She is visible in the early pre-dawn sky, while Mercury (in trine to an Aries Moon) is hugging the horizon line. She is also right opposite Jupiter and the centralizing energy in the powerful “yod” with Jupiter that has been in place since the New Moon that I described to you last. 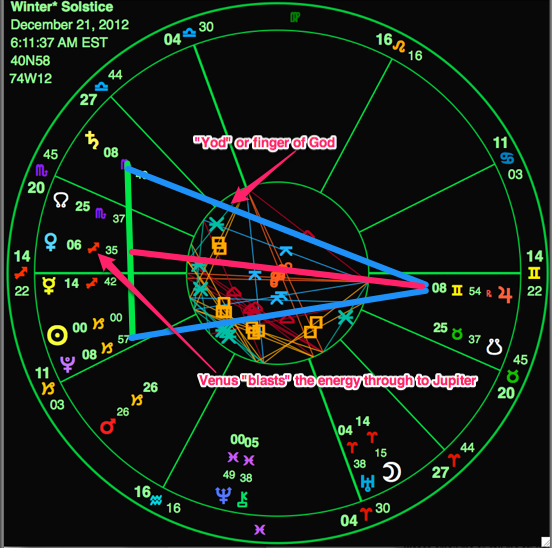 On Winter Solstice, Venus is the “rising star” in the East who is assisting us with the integrating energies of the powerful yod of Jupiter. Just before Spring of this year, Venus and Jupiter conjoined in a great spectacle in the skies. Now they are in opposition, and with the assistance of Saturn and Pluto sextiling Venus, Venus is invoking all who gaze upon her at the dawn of Winter Solstice to put aside politics and move our hearts with her as she meets Jupiter’s gaze from below the horizon. He sets as her “star” power rises. The Sabian symbol for Venus at 7 degrees Sagittarius is: “Cupid knocks at the door of a human heart” and it implies a challenge to emotional rebirth. We are standing up in our consciousness, using the power of the internet and our ability to communicate like an “arrow” for that which we will no longer tolerate in our community to sustain our families and our lives: the politics of “hard heartedness” and selfish greed. This is the shining moment in our new reality where we will move forward in united thought regarding the “peace-full” use of “bull-ets”. The gaze of the red star Aldebaran is being amplified by Jupiter like a laser ray gun, awakening our universal hearts to a solution now. Often, when one “hits a bull’s eye” a bell goes off. The sound of bells is awakening us all to a higher dimension of unified consciousness…where so many of our “planetary protectors” are getting their wings! 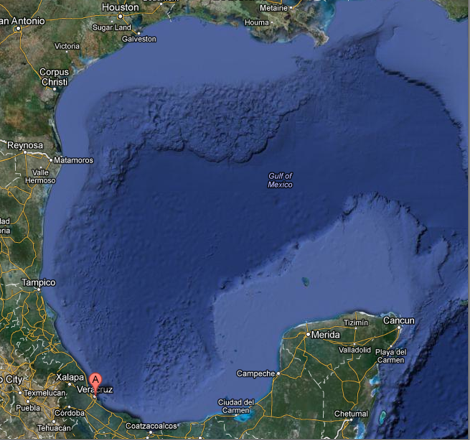 And so, for this reason, I’ve been guided to choose the Bird Person of Veracruz for our Winter Solstice 2012 posture. When researching Veracruz (which means “true cross”), I not only thought of the “cross” in the astrological sign for Jupiter (and being “caught in the crosshairs” of a gun), but also the Winter Solstice alignment where our Sun’s pathway (ecliptic) crosses with our galaxy’s rotational pathway (the galactic equator) — which has been happening since 1998. I believe this alignment is the “true cross” for the energies of the Universal Tree to manifest and which are accelerating our spiritual alignment at this time. Winter Solstice is also a time of honoring the return of the light of our Sun by placing lights on trees! The bird person statue from which the posture originates is 24.5 inches tall and is made from burned clay. It is one of the most perfect figures of Central America and in the culture, birds are the animals which are able to move freely between the world of the living and the world of the dead. This posture creates an intense feeling of stillness, drowning into absolute calm connected with the feeling of having roots in the cosmos. What the Bird Person of Veracruz posture shows us is the simple act of being open to receive the impulses being transmitted from the heart of our galaxy and to raise our consciousness to feel the peace that is our birthright and is truly possible on Earth. The posture also creates a “pentagram” or 5-pointed star (another symbol for Venus) with our arms, legs and head! When researching this posture, I learned that Veracruz, Mexico is host to the greatest raptor migration spectacle in the world, where an incredible passage of more than 4.5 million raptors pour overhead. The Olmec, one of the oldest cultures in all the Americas and the forbears of the Maya, inhabited this region. Perhaps Veracruz acts as a vortex for our consciousness to “move vertically” and fly through time and space to unite us with our ancestors at this pivotal moment. I also discovered a strange “link” via an image I saw at our last New Moon during the Bear Spirit posture. Often an image will come to you while in trance that seems like a puzzle piece that only you can figure out. I have been carrying this curious “re-linking” image that the Bear Spirit showed me: a large chain link that had been broken in half and then re-assembled — like big round arms/elbows linking in with one another, opening portals that didn’t connect in that manner before. 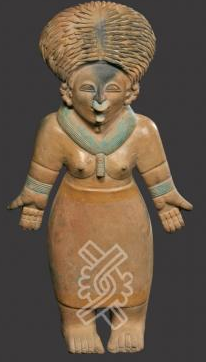 And then I came across a female version of this posture in a statue from Jama Coaque, Ecuador where her eyes are described as “half moons” and her mouth is also slightly open. The image of this terracotta statue had the “glyph” I was trying to get clarity on — super-imposed right over it! 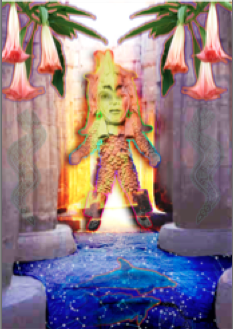 So it is with great joy and “link-filled” excitement that I invite you to join me for this Winter Solstice pre-dawn ritual posture with the Bird Person of Veracruz. Suggested expression of appreciation: $25. Please email me or call me at: 845-753-9347 to reserve your place. Also, if you cannot join us here in Sloatsburg and you have the rattle/drumming CD, please feel free to join in remotely for the postures. Email me for more instructions, if you need to. If you are doing a remote posture, I suggest you begin your smudging at around 5:45 am EST. Bright Cosmic blessings — laced with Venus!